← Prep alumni Bob Sanders brings the Super Bowl title back to Erie! 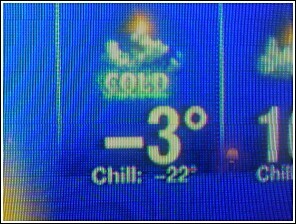 This was the temp a few days ago as I woke up. yeah negative fokkin 3 outside. It took me 30 minutes to warm up my car yet my landlord doesn’t understand why we need the ice removed from the steps to our parking lot. Hell, we need snow removed. Called his office and the girl said “well we did it last thursday.” Correction, 2 weeks ago today was the last time they came around. I swear that monkeys work at every job where customer service is involved. So, who wants to help us move? On a side note, according to a post on ErieBlogs.com, WJET reports that Lake Erie is now about 70% ice covered. Almost time to start driving cars across it again! You go first though, I’ll watch. Seriously, people used to do it in the early 1900’s.